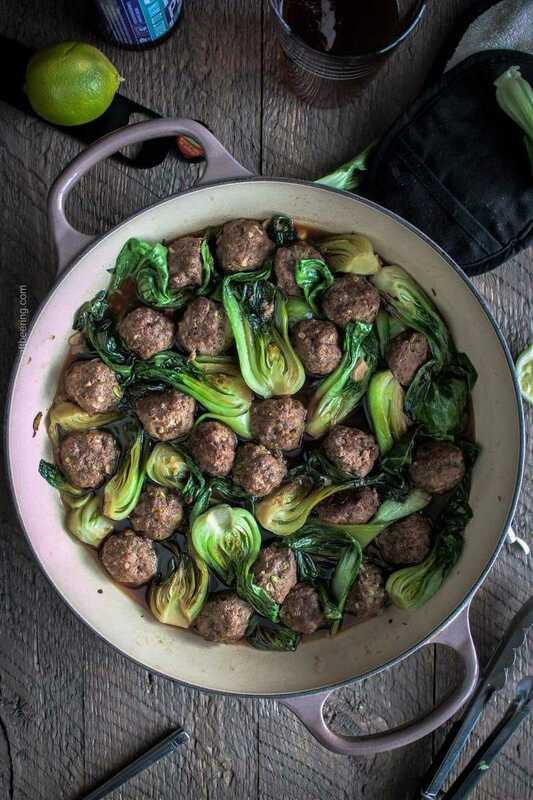 Beer braised baby bok choy and beef meatballs with Chinese five spice is a favorite cooking with beer dish in the Perrine family. 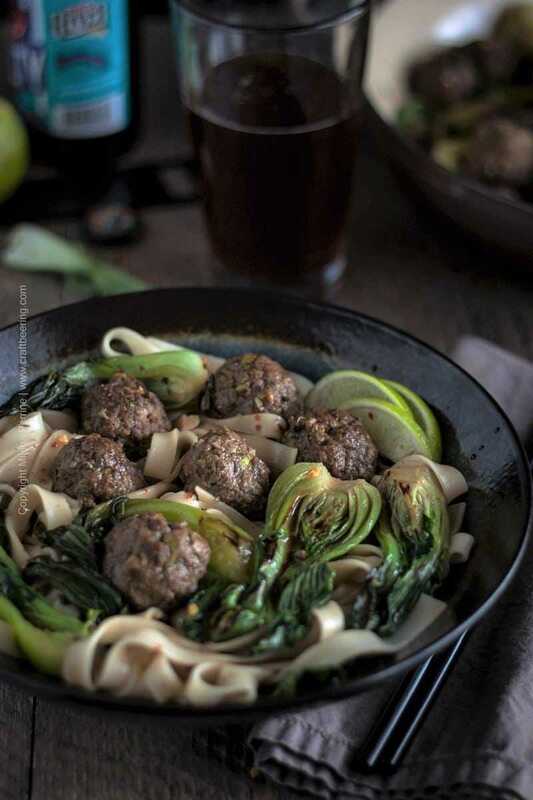 Infused with the deliciousness of a sweet brown ale or a robust malty bock lager the baby bok choy is tender, yet still has some crunch, the beef meatballs are moist and the braising liquid makes for a tasty broth should you choose to serve the dish over noodles (you should). To create the braising liquid the beer (a bock this particular time) makes fast friends with soy sauce, brown sugar and beef stock. The resulting deep umami flavor can prompt you to buy baby bok choy again tomorrow. There are also caramelized pieces of garlic floating around further ‘sweetening’ the deal. The bock actually makes its way into the beef meatballs themselves, way before they get to join the braising party. Why miss an opportunity to further infuse them with flavor? The bock lager we used for today’s beer braised baby bok choy is truly representative of the German style and is brewed by Red River Brewing Co. in Louisiana. 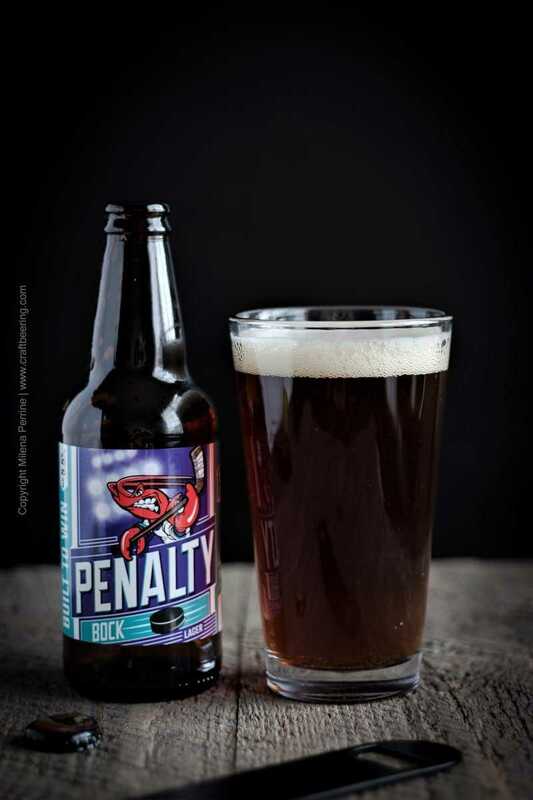 Penalty Bock has ABV of 5.5% and IBU of 22 – no pronounced hop flavor or burnt character. Safe to say that its strong malty character runs the show and what a show it is. Very robust caramel and bready notes, while the hops presence is felt on the palate as a complex herbal infusion, followed by a residual sweetness. I am stoked we were sent samples of it to try by the Microbrewed Beer of the Month Club. We are really becoming fans of their US and International Variety Beer Club. Each month’s shipment includes four craft beer styles, two from the US and two from abroad. They are expertly selected seasonal collections – sometimes even rare special batches brewed for the customers of the club, like in the case of the Pickled Santa I used to make Mulled Ale for the blog. Every shipment comes with a ton of information on the brews included and the respective breweries. Back to our beer braised baby bok choy. All in all, we consider the following styles of craft beer as best suited for the dish. Get craft beer from all over the world delivered to your door each month by joining the International and Domestic Beer of the Month Club. Adding a bit of heat and mild acidity to the served dish works very well. My personal preference is for red chili flakes, Chris usually stays faithful to sriracha sauce. We both think a squeeze of lime is the way to go. Or Meyer lemon. We don’t see those very much where we shop, but if your produce options are better or you happen to have a Meyer lemon tree in your back yard you are all set:). As to the noodles – I’d say go with whatever type you like best. I always wonder how to determine recipe yields. For example this one here… Is it for four people or just two plus a child sized portion? If I wrote four, it might not stretch so far and someone will complain they went hungry. If I wrote two and a half, not only does it sound weird, but then someone is bound to accuse us of being gluttonous sinners. If I wrote three… that’s a bit awkward too..I usually go with Serves 3-4. Not perfect, but what am I supposed to do? What would you do or what would you rather have me do? Chris tells me about the servings determinations he uses at work and I would rather not go there. For example, one medium potato in mashed form is considered one serving. Not to me. I love mashies. Or so many pounds of beef are for a party of so many people. A cheeseboard for 100 is this many pounds of cheese based on this many ounces per person. Uughhh. *This post contains affiliate links which help support our blog at no cost to you. 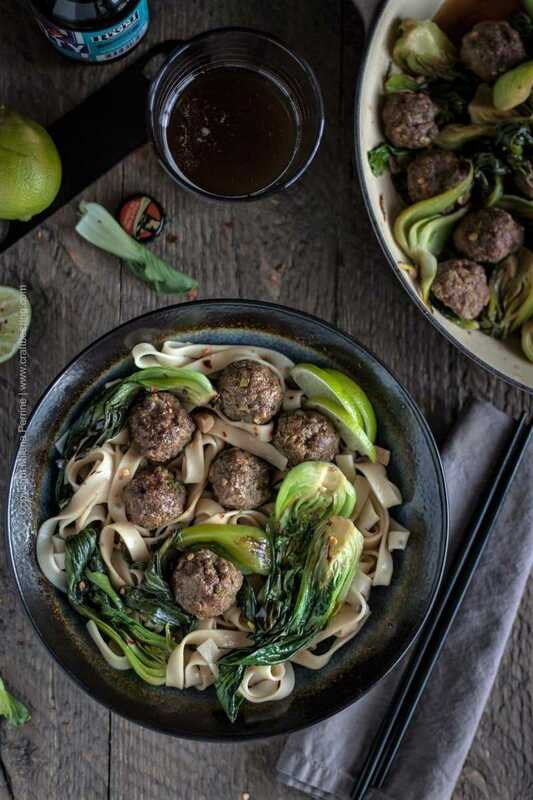 Baby bok choy and Chinese five spice beef meatballs are braised in a delicious malty, salty, umami goodness leveraging the robust tasted sweetness of bock lager. This recipe is a keeper. Once a month kind of deal. Or you might find yourself making it more often. Prepare the meatballs first. Preheat the oven to 400°F. In a mixing bowl combine all the ingredients for the meatballs. Prepare a small ramekin with vegetable oil and a parchment paper lined baking sheet. Using your hands incorporate the ground beef with all the other ingredients, 'knead' and when well mixed, begin to form small meatballs, dipping your fingers in the vegetable oil occasionally. Arrange the meatballs on the lined baking sheet and cook in the oven for just over 20 min. Check them and if done, take them out of the oven, if not, put them back in for another 5 minutes. Set aside to add to the baby bok choy. While the meatballs are cooking in the oven, warm up the beef broth and stir in the brown sugar (until dissolved) and then the soy sauce. Set aside. In a large pan with a lid heat the vegetable oil over medium high heat. Place the baby bok choy quarters inner side down first and let them cook for about 2 min. Just as they begin to caramelize, turn them to their other side for another 1-2 minutes. Add the thinly sliced garlic, gently move it around the pan with the baby bok choy, no more than 1 min. Deglaze the pan with the beer, scrape any browned bits from the bottom with a wooden spoon and then add the beef stock mixture. Add the meatballs (should be done by this time). Bring to simmer, then turn the heat down to medium low. Cover with the lid and let cook for 5-8 min, then remove from the heat. In the meantime cook the noodles according to the package instructions. 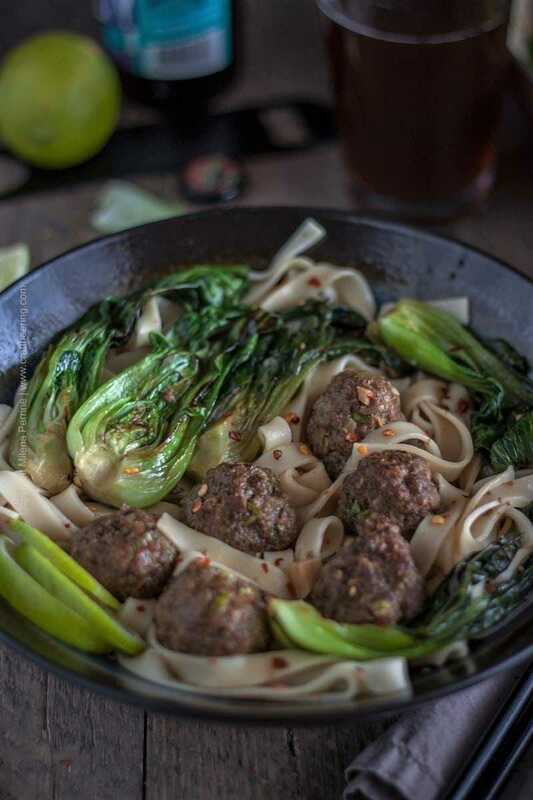 Serve the beer braised bok choy and meatballs in a bowl over noodles and use the braising liquid as broth. Garnish with lime slices and red chili pepper flakes (optional). Thank you, Karrie!You stay warm and safe up there, I cannot believe the weather this year. LOL…I feel the same way with the “yield” I could never figure that part out to be honest ha..ha..! I mean…seriously, if you ask me, 4 servings probably will starve me and my 4 year old who can eat more than any child I’ve ever seen! 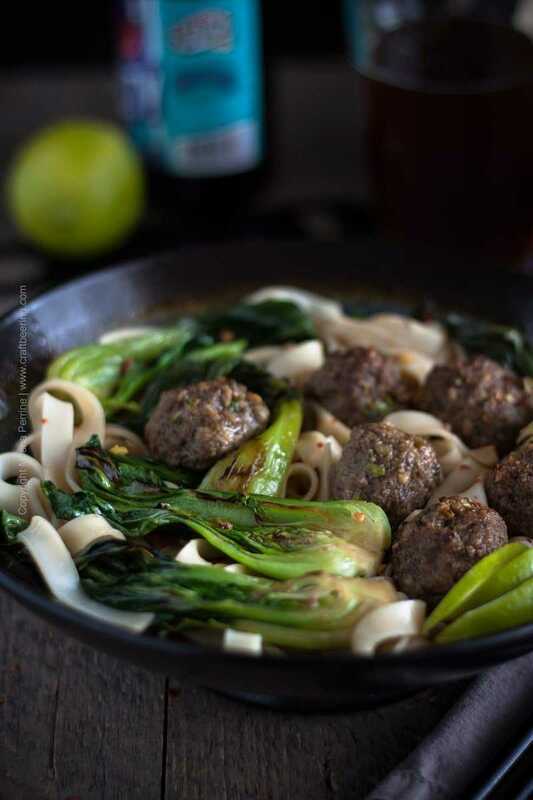 This beer braised baby bok choy beef meatballs are amazingly creative! Loving your moody photographs too! Thank you for the love, Marvellina! I can relate to a four year old who can eat. Especially when it is something he really likes – he can eat more than me. I really do not know where it all goes. I frequently check under the table, just in case. I guess the riddle of the recipe yields will never be satisfactorily solved, lol. What a delicious sounding recipe!!!! I have never met a meatball I didn’t like…correction…love! And these are no exception! Wow these are packed with flavor! Haha, meatballs are sooo good, I agree. Thank you, Annie! Want to know something weird? I had a dream last night that I bought bok choy. I’m pretty sure I’ve never in my life purchased bok choy so I don’t know why it was floating around my subconscious. But maybe it’s a sign that I need to try this recipe? It sounds fabulous! Have a great weekend! Wow, Kelsie, maybe it was a sign:) You should try some baby bok choy, if only to see what the dream was all about. Have a great weekend! I think you will like braising bok choy, Christina! Hope you make it soon. Beer, soy sauce, brown sugar, and beef stock…Loreto would be in sauce heaven 🙂 . I’d confess you that I’d eat the bok choy…I’m not an intransigent vegetarian, so even if I won’t eat the meatball (more for Loreto 😉 ), I’d definitely try the choy and scoop some sauce with bread 🙂 . Beautiful dish, Milena! P.s I think 3-4 people is correct 🙂 . Thank you, Nicoletta. Glad you like it! I am sure Loreto will enjoy the meatballs. I wanna join that braising party!! 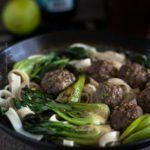 I seriously love bok choy…so those paired with meatballs and noodles is my idea of comfort food! That’s some wicked party goin’ on! Pinned! This beer of the month club you speak about…how cool is that? I always love to try new varieties and it would be pretty awesome to have something new sent to me to try each month! P.S. As usual – your photos are GORGEOUS!! Thank you, Dawn:) You are very welcome to the braising party!